My healing journey from psoriatic arthritis in words and pictures. Here’s a seven-photo journey through my healing from psoriatic arthritis and many other associated ailments connected with autoimmunity and inflammation. Click on the photo for a larger image. 1. (Dreadlocks, fat, top left) Early 2010, just before I got really ill. I weighed around 15 stone (210lbs). Ten years of neglect after being in very good shape and quite lean at a muscular 14 stone (196lbs) back in 2000 had left me with all sorts of issues from bad digestion to the rumblings of what was to become crippling joint inflammation by October/November that year. I took this photo as a “before” hoping to get back into shape with diet and exercise and chart my progress on my website. Little did I know things would get far worse before they got better… But what a learning curve it was! 2. 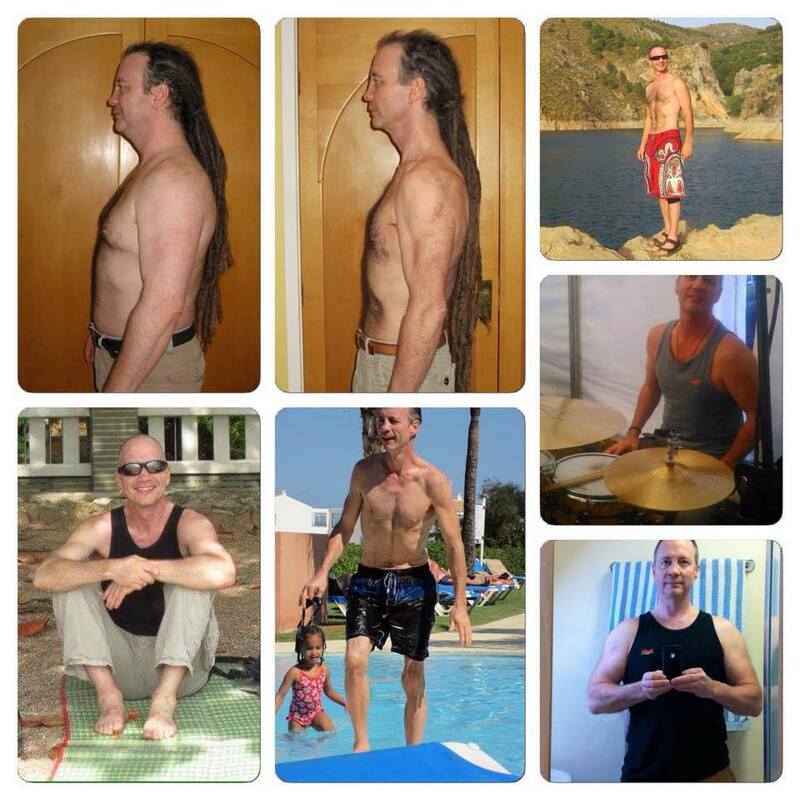 (Dreadlocks, skinny, top middle) Summer 2011, after panicking from the onset of the arthritis, briefly taking the nasty conventional meds and getting obsessed with juicing, fasting and being raw vegan. By this time I weighed about 10 stone (140lbs). I’d lost all the remains of my muscle, and I was still full of inflammation, brain fog and depression. I was very arthritic and inflamed with no chance of training to rebuild the lost muscle. 3. (Sitting, bottom left) January 2012 on a holiday to Thailand, still about 10 stone (140lbs), but this shows how inflamed the ankles were. Walking was nasty unless dosed with painkillers. I might be smiling for the photo, but life wasn’t much fun most of the time. 4. (Getting out of pool, bottom middle). Spain, 2012. This is the photo that really shocked me. Oddly, I am better here, having discovered GAPS and reintroduced protein, and I was running on fats rather than sugars, but being in ketosis and doing cold thermogenesis burned the last of the fat and left me weighing 9 stone (126lbs) and looking like a concentration camp victim. Although there is less pain, the damage can be seen – left knee very swollen, quad muscle all but gone. It was a low point, but when you hit rock bottom you can think about bouncing back. 5. (Red shorts, top right). Autumn 2013, Spain again. The return to health begins. Much improved, and the switch from veganism to high fat/low carb and some protein had me maybe weighing 10 stone again with no increase in body fat. Two days later I was screaming in Granada A&E with a big kidney stone stuck in my ureter, but systemic inflammation was massively reduced. I now understand that the kidney stone was from oxalates in veg, especially tons of juiced spinach. No further kidney problems after going low carb. 6. (Drums, middle right). Summer 2014. Gradually inflammation died down, allowing me a winter of weight training (2013/14), which had put some of the muscle back. Introducing a few carbs in the spring in the form of the odd sweet potato, which took me out of ketosis, had brought a little fat back, but I was in pretty good shape, weighing maybe 11.5 stone (161lbs). I was back playing drums, which I never thought I’d be able to do. I was feeling great, and a lot of the emotional issues had been addressed, which are at the root of autoimmunity. By then there was absolutely no trace of the disease in my ankles, with just a little niggle in left knee and right wrist, but getting better every day. 7. (Bottom right, mirror selfie). Spring 2015. Another winter of weight training had brought back more of my lost muscle. I was feeling even better, but my new mended gut/gut flora allowing me wine and chocolate had put on more fat than I’d have liked and got me to nearly 13 stone over the winter. Still, it was fun! In that photo I weighed about 12.5 stone (175lbs). Joints were good and the damage healing (docs say that’s impossible) and even the wasted left quad muscle was growing back nicely. The improvements continue day by day on all levels – physical, emotional and spiritual… Improvements ramped up yet again when I went zero carb 100% carnivore in 2016. To find out more see my previous article on what causes autoimmunity HERE. Hi, just finished your book and found it informative. I’m seeing my doctor on the 15th June and would like to ask for the med you recommended; however, I can’t find it in the book. Could you tell me what it is. The doctor is recommending Prednisone, which I’m sure I don’t want. thanks. Hi, Arabella. Glad you enjoyed the book. Yes, the only med I think is useful is Low Dose Naltrexone, which is very safe. The chances are the doc won’t prescribe it because its patent has run out, so nobody makes any money out of it and they want to push the latest expensive drugs, which, quite frankly, are all very dangerous. Prednisone is incredibly effective and very old, but it should really only be used in life saving circumstances like anaphylactic shock etc, not chronic conditions. Even docs know this.